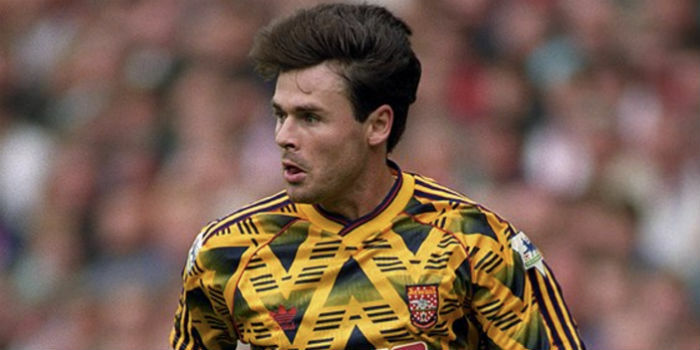 According to Footy Headlines – a reliable source for kit news – Adidas will mark their Arsenal return by releasing a modern interpretation of our cult classic ‘bruised banana’ shirt. As was the case in the mid-90s, the kit will be yellow and blue and feature red as an accent colour. As things stand, no images have been leaked, but hopefully, they’ll follow soon enough. We could do with something to get excited about! As an added bonus, there’s also talk of Adidas doing a retro Gunners range, inspired by other old kits. The Gunners confirmed the upcoming Adidas kit deal with a single tweet in October. It’s believed the package is worth £300 million – £60 million a season for five years – which is double the figure currently earned from Puma. Out current Puma deal runs out at the end of June, and given the last set of kits they’ve foisted upon us nobody is going to shed too many tears about that. We can safely assume that our Adidas collection will then be released in July. At last! Some good news. LANS! Can’t wait to see the back of green and blue kits. Arsenal were always yellow for away. Except when they were blue and green in the eighties…. You never saw the back of the green and blue kits? They were the same color as the front. The white era however. What were they thinking? That’s the one. I’ve never really been convinced by those colours though. Yellow and blue all the way for me… although I did quite like he gold one. The gold kit was a good look. Close enough to yellow to be acceptable. Yes, its true. In the 82-82 Season we occasionally sent out a team entirely composed of goalkeepers. I think the keepers from the Under 12 team really enjoyed their first team appearances as strikers. Are the ones that the report a week ago showed fakes? I think they’re pretty nice although I think it’s not really a modern banana kit. But still, fine enough. I was thinking the same. It could be that one as it is yellow and blue with a red accent (on the sleeve) as mentioned in this article. Isn’t that our back three? That was the triumvirate of Ivan, Raul and Sven. A retro kit range is as close to an open goal you can get. I absolutely adore the classic Arsenal cannon and the adidas trefoil isn’t too bad either. It is a classic but it is appalling. I wouldn’t mind a new Limpar though. Man, I really don’t see why everyone hates on the puma kits. I think at least the home ones have been pretty decent. They had a few decent ones but in general looked like they were whipped together the day before the unveiling. shame to see the return of an iconic kit at a time when the team will do it very little justice. cruel almost. We lost away to Wrexham in that kit…. We don’t know what next season holds for us. Feck the kit. Rambos gone. The only news to bring a smile in these days of chaos. The lads are playing like their bananas have been bruised. Inspired choice. I’m crossing my fingers for matching shell suits. Happy to hear this. However a part of me thinks all our happy memories of this kit will be ruined when the present squad play in it. That bruised banana kit looks like S*^#. Please don’t bring that thing back. All good! Now can we have a retro team as well? You know – one that will fight tooth and nail for absolutely everything and frighten the opposition to death? Any rumours we’ll change the Cartoon Cannon on the crest back to something a little more classy?